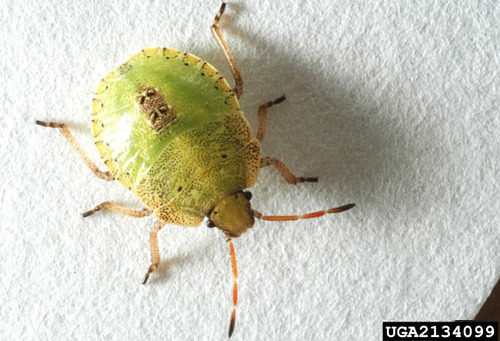 The brown stink bug, Euschistus servus (Say), is a serious pest along with a number of other common stink bug species in most seed, grain, nut and fruit crops in the southern U.S. Reduction in pesticide use in major crops, especially in cotton, has led to a recent resurgence in populations of the brown stink bug. Peach is one of the first food crops damaged in spring by the brown stink bugs. During most years, they hibernate during the winter and then emerge in spring to arrive in peach orchards during the late bloom and shuck split stage as fruit begin to form. However, during mild years, they may remain active throughout the winter feeding on winter annual weeds and other hosts. Under drought conditions, the bugs may attack fruit in much higher numbers. In peaches, stink bugs are also called catfacing insects because, after the tissue is injured, the surrounding, healthy plant tissue continues to grow, resulting in a scar that resembles a cat's face. It should also be noted that other stink bug species may also cause similar damage in central and south Florida peaches. In pecans, they are termed kernel feeding insects because they injure the nut kernels by feeding, with most injury occurring in late season. Figure 1. View of kernel spots on four nuts caused by feeding from the brown stink bug, Euschistus servus (Say). Photograph by W. Louis Tedders. Brown stink bugs can be found across all of southern Canada, much of North America and often throughout the year in parts of the southern U.S.
McPherson and McPherson state that E. servus occurs throughout North America with two subspecies. While E. s. servus (Say) occurs throughout the southeastern U.S. from Florida through Louisiana to California, E. s. euschistoides (Voltenhoven) occurs across Canada and the northern part of the U.S. 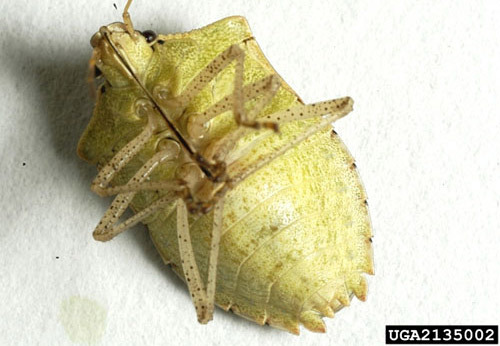 Adults: Adult brown stink bugs are long, shield-shaped insects, grayish-yellow with dark punctures on their back, and piercing-sucking mouthparts. The fourth and fifth antennal segments are darker in color. The ventral surface usually has a pinkish tinge. Cheeks are large, passing the clypeus in length and more pointed. The humeral angles of the pronotum are rounded. The body length varies from 10 to 15 mm for adults. Figure 2. Adult brown stink bug, Euschistus servus (Say). Photograph by W. Louis Tedders. Figure 3. Ventral view of adult male brown stink bug, Euschistus servus (Say). Photograph by Herb Pilcher, USDA Agricultural Research Service, Bugwood.org. Figure 4. Ventral view of adult female brown stink bug, Euschistus servus (Say). Photograph by Herb Pilcher, USDA Agricultural Research Service, Bugwood.org. 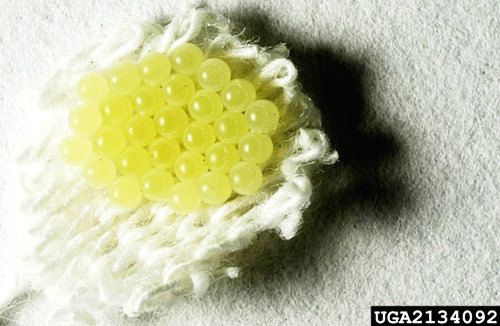 Eggs: The eggs are yellowish-translucent, but their color starts turning toward a light pink before hatching. Figure 5. Newly laid egg mass of the brown stink bug, Euschistus servus (Say). Photograph by Herb Pilcher, USDA Agricultural Research Service, Bugwood.org. Figure 6. 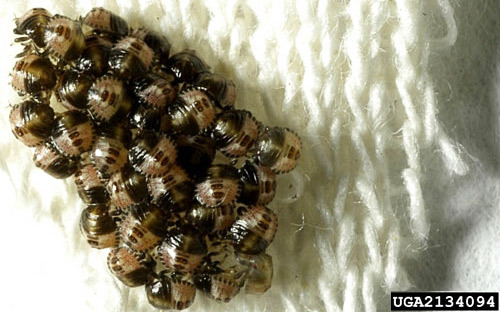 Five-day-old egg mass of the brown stink bug, Euschistus servus (Say). Photograph by Herb Pilcher, USDA Agricultural Research Service, Bugwood.org. Nymphs: The nymphs develop through five instars that require ~29 days for development. 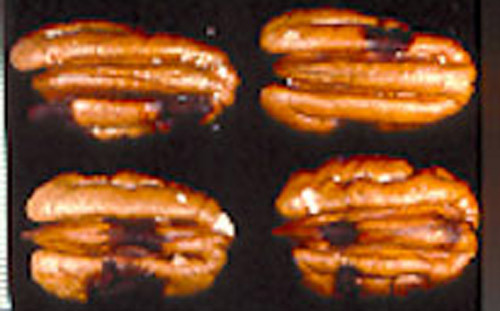 They resemble adults but are smaller and oval. They are usually pale green. Figure 7. First instar nymphs of the brown stink bug, Euschistus servus (Say). Photograph by Herb Pilcher, USDA Agricultural Research Service, Bugwood.org. Figure 8. Fed second instar nymphs of the brown stink bug, Euschistus servus (Say). Photograph by Herb Pilcher, USDA Agricultural Research Service, Bugwood.org. Figure 9. Fed third instar nymphs of the brown stink bug, Euschistus servus (Say). Photograph by Herb Pilcher, USDA Agricultural Research Service, Bugwood.org. Figure 10. Fourth instar nymph of the brown stink bug, Euschistus servus (Say). Photograph by Herb Pilcher, USDA Agricultural Research Service, Bugwood.org. Figure 11. Fifth instar nymph of the brown stink bug, Euschistus servus (Say). Photograph by Russell F. Mizell, III, University of Florida. Adults overwinter in protected areas such as ditch banks, fence rows, under boards and dead weeds, ground cover, stones, and under the bark of trees. They become active during the first warm days of spring when temperatures rise above 21°C. 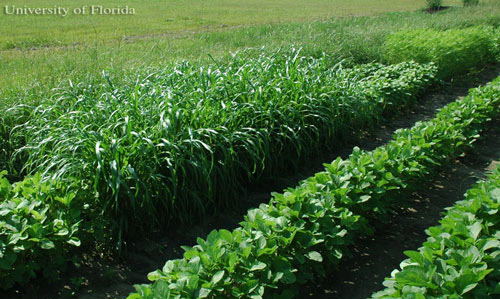 Normally the first generation develops on wild (noncrop) hosts, while the second generation typically develops on cultivated crops. 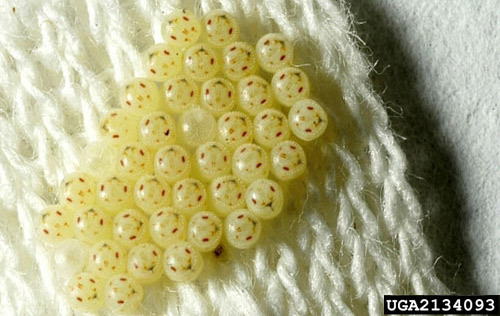 Each female oviposits about 18 egg masses, averaging 60 eggs, over a period of >100 days. Approximately four to five weeks are required from hatching to adult emergence. Euschistus servus have as many as four to five or more generations per year in Florida. Adults are strong fliers and will readily move between weeds and other alternate hosts. Figure 12. Nymph (left) and adult (right) brown stink bug, Euschistus servus (Say). Photograph by Russell F. Mizell, III, University of Florida. Brown stink bugs often feed on the vegetative parts, flowers, stems and foliage of the plant, as well as the seed, nut or fruit, and this makes them important pests of many crops. 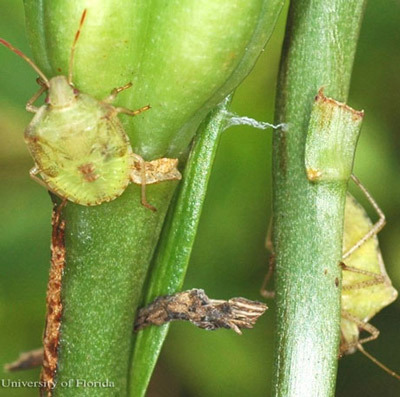 Brown stink bugs are found on a variety of hosts, such as shrubs, vines, many broadleaf weeds, especially legumes, as well as cultivated crops such as corn, soybean, sorghum, okra, millet, snap beans, peas and cotton. Adults feed by inserting their needlelike mouthparts into stems, leaves and seed pods. While doing so, they inject toxic substances into the plant parts that may cause the structures to abort or inhibit plant development in the area of the punctures. Penetration by the mouthparts can cause physical damage. A combination of mechanical and chemical damage to the growing point of the plant may be responsible for the injury and symptoms seen in the field. The degree of damage depends on the developmental stage of the plant when it is attacked. 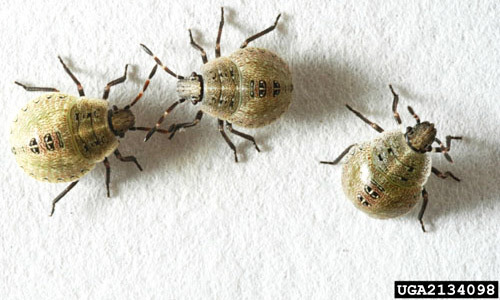 Brown stink bug feeding causes three main types of damage to grains: they may kill small seedlings, produce stunted plants or cause "suckering", which is the production of tillers from the base of damaged plants. Tillering is considered the most dramatic symptom because it first appears 10 days or so after the real damage was caused. E. servus can reduce grain yields in several ways, e.g., stand reduction caused by feeding and killing small seedlings. Brown stink bug feeding affects surviving plants by inhibiting development of root mass and making plants more susceptible to other stress factors such as pathogens or attack by other insects. Tillered plants may produce little if any grain and if they survive, they may be considered as weeds, competing for water and nutrients with healthy plants. The eggs and nymphs of stink bugs often suffer high mortality from parasites, predators and pathogens. 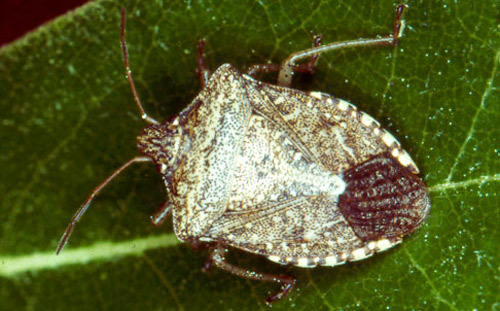 Because adults tend to aggregate, the distribution of brown stink bugs within a field may be highly aggregated, especially along edges or borders. Stink bugs may be controlled with insecticides, but many crops have specific action thresholds that should be observed to provide more economical management. Plus, stink bugs are relatively tolerant to most insecticides making suppression difficult. 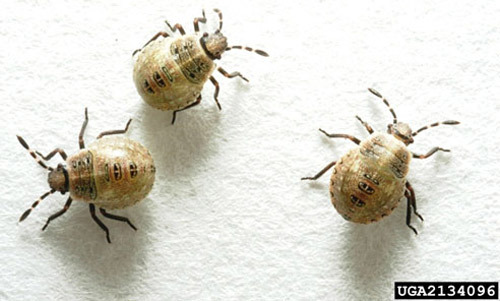 Practices that eliminate seed heads and broadleaf weeds help minimize stink bug populations. Monitoring can be done by direct tree examinations and fruit damage counts. Beating tray sampling, sweep sampling and using the Florida Stink Bug Trap with the aggregation pheromone are also ways of monitoring and capturing them. 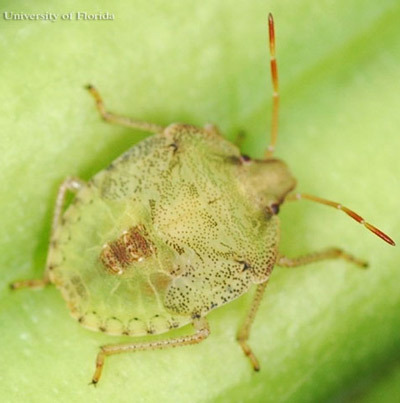 Trap crops of triticale, buckwheat, sorghum, millet and sunflower may be grown on the exterior of gardens, orchards and other types of production areas to intercept the stink bugs before they enter the cash crop. Small growers may wish to grow the trap crops in large containers so that they can be easily moved to where they are needed. Figure 13. 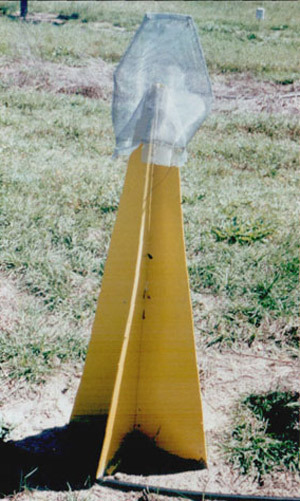 Florida stink bug trap. Photograph by Russell F. Mizell, III, University of Florida. Figure 14. Trap crops for stink bugs. Photograph by Russell F. Mizell, III, University of Florida. Aldrich J, Hoffman M, Kochansky J, Lusby W, Eger J, Payne J. 1991. Identification and attractiveness of a major component for Nearctic Euschistus spp. stink bugs (Heteroptera: Pentatomidae). Environmental Entomology 20: 477-483. Borges M, Zhang A, Camp MJ, Aldrich JR. 2001. 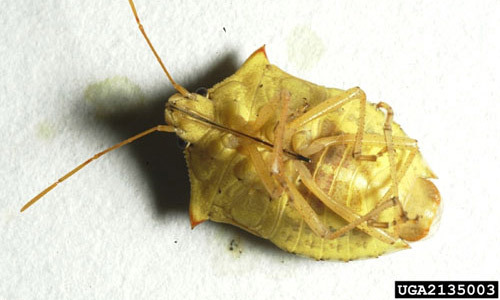 Adult diapause morph of the brown stink bug, Euschistus servus (Say) (Heteroptera: Pentatomidae). Neotropical Entomology 30(1) Londrina. McPherson JE, McPherson RM. 2000. Stink Bugs of Economic Importance in America North of Mexico. CRC Press, Boca Raton, Florida. 104 pp. Mizell RF. (2015). Stink bug management using trap crops in organic farming. eXtension. http://articles.extension.org/pages/61596/stink-bug-management-using-trap-crops-in-organic-farming (21 July 2018). Virginia Tech. (2008). Green stink bug, Acrosternum hilare (Say); brown stink bug, Euschistus servus (Say); and dusky stink bug, Euschistus tristigmus (Say). The Virgina Fruit Page. http://www.virginiafruit.ento.vt.edu/StinkBugs.html (7 May 2008). Publication Date: May 2008; Last revised July 2018.